Desperate times call for desperate measures. 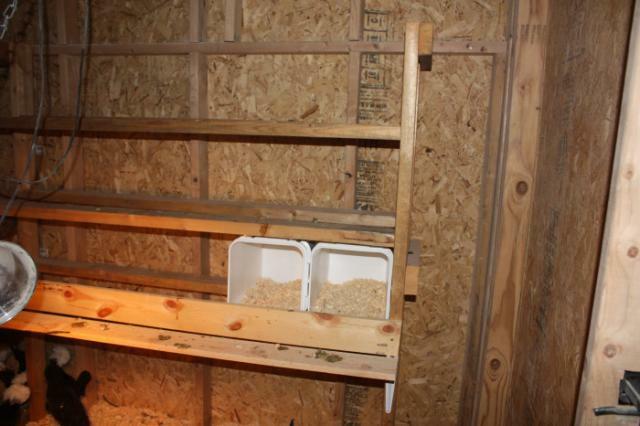 The girls needed nest boxes and I had limited time and resources. I only needed a temporary setup so for now, this works. As the picture shows, I have cats. So we have Kitty Litter. It comes in buckets, leaving us with lots of buckets. Buckets that are about the size of a nest box.... hhmmm and they fit, almost perfect. I made a few modifications... added a toe kick to the front to keep the nest from falling out of the box and a perch in front cause that first step is a lu-lu. The girls are funny, there are 10 buckets in there and they all use the same two, sometimes a third, the rest go virtually unused. Oh well. I leave the top rack open so the birds can roost up there. They have another roosting rack (a pallet frame with the slats pulled off) but some like to be higher off the ground. 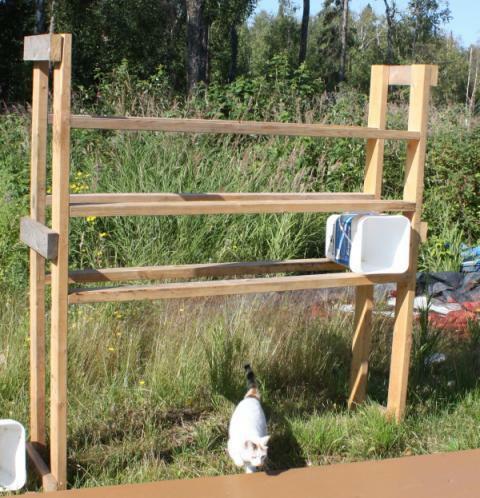 It's cold here in the winter (-30f) so the 2X4 construction of the rack and the roost provide a nice wide place to sit so the breast feathers cover thier toes and prevent frost bite.